Wheels' US correspondent trips over to the Swiss city for a shot of optimism in an otherwise dark car market. 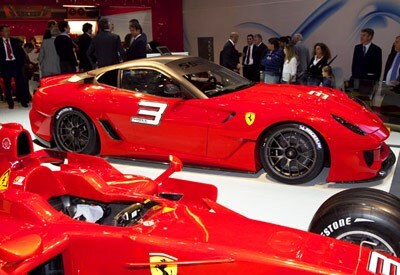 So what was the star of the 2009 Geneva Auto Show? The show itself. The fact that in the face of all the troubles on the world economic fronts--with a special emphasis on the auto business--Geneva still put on a display of glamour, color and excitement. A few stands were dressed down, with Chrysler's looking like a thinly spaced parking lot, though right next door its old partner Mercedes-Benz had a stand that looked like an overfilled lot. And just down a bit the aisle Rolls-Royce was showing its dandy-looking, BMW 7 Series-based 200EX. Amazing how that Rolls Phantom body shape, which is not all that attractive full size, can look quite good in a smaller size. Aston Martin's stand was overflowing. The DBS model goes open-top with a Volante version, while the small Aston is now full-bore with a V-12. On the first press day the stand's big feature was the styling mock-up of the upcoming One-77 supercar next to a example of its carbon fiber-aluminum chassis, a delicious example of the engineering art, with the emphasis as much as the art as the engineering. For the second day, the big news--and we mean physically BIG--was the Lagonda concept. Based on a Mercedes GL chassis, the Lagonda is, let's say, unusual looking. Lamborghini gave us its latest SV (SuperVeloce) in the form of a Murcielago LP 670-4 with all-wheel drive, while Ferrari presented the 599XX, which looks like a race car, but isn't. A "select group of clients" will be able to buy the 522-kW V-12 carbon fiber technical laboratories to use on track days. Bugatti had a Veyron done in flat blue, while Bentley's Continental Supersports has 463 kW, 799 Nm of torque on petrol or E85 and will get to 100 km/h in just 3.8 seconds...with all the luxury expected from a Bentley...but no rear seat. Of course Geneva is tuner heaven, from Louis Ruf to Alpina to Brabus, which this year also showed the Tesla electric sports car. There were the usual odd concepts, like the latest bizarro from Rinspeed, the iChange, which is electric, powered and has a body that adapts from one to three occupants. Giugiaro worked with Frazer Nash in England to create the Namir, claimed to be the world's fastest hybrid. Mixing gas and electric motivation, it is said to get to 100 km/h in under 4 seconds on its way to a top speed of 186 mph. Dramatically slower and less exotic was Mitsubishi's all-electric i MiEV Sport Air bean-shaped small car concept, while dramatically more desirable was Infiniti's Essence grand touring car, which mixes a 434 kW 3.7-liter turbo V-6 with a 158-kW electric motor...and is quite attractive. Looking like a concept, but ready for delivery if you'd like one is the Zagato Perana Z-One. Built in South Africa, the Corvette LS-3 V-8 sports car will have a price somewhat under 100,000 Euros and 0-100 km/h in around 4 seconds. There was one other concept that drew great interest, but not the classic "oohs" and "aahs" from an appreciative crowd: BMW's 5 Series Gran Turismo Concept. Leaves one scratching one's head in much the same way the X6 does. And then there are the real cars from super cheap (Nano Europa), to fun (Fiat 500C with its open roof) to quick (Mazdaspeed3) and economical (VW Polo). Ditto with the U.S.-bound Chevrolet Spark. And we can't wait to drive a production version of the proposed Alfa Romeo MiTo GTA. So, what about Geneva 2010? Are we seeing a true firming of confidence or a last gasp...can the show be as glamorous, colorful and exciting a year from now?